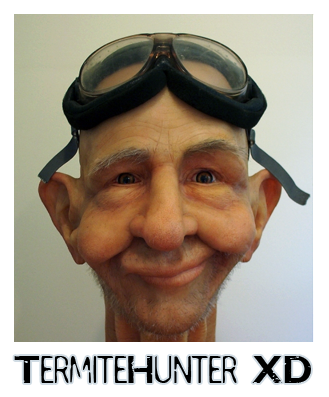 TermiteHunter XD is a traditional moving cache who patrols the Greater Charlotte-Mecklenburg area inspecting cache sites for structural pests. He has room for trackables or swag but does not contain any in its original state. Bring your own pen. TermiteHunter XD likes to hang around near exisiting caches and travel to other parts of the Greater Charlotte-Mecklenburg area to check on those caches as well but prefers to check on them from a distance as to not be discovered by mistake. When you find TermiteHunter XD, please log a find indicating you have picked him up. You may move him anywhere within the greater Charlotte area (Mecklenburg County and its surrounding counties) but please place him within reasonable distance existing caches so that future seekers can also find the caches that TermiteHunter XD is checking on if they wish. Just ensure you don't place him TOO close that he is discovered by mistake. Once you have placed him, please log a MOVE stating you have done so and list the coordinates for where you have placed him. It would also be helpful to list the D/T raiting of the new location so future seekers know what they are getting into. PLEASE REHIDE THE CACHE WITHIN 48 HOURS OF PICKING UP IF MOVING. GrezvgrUhagre KQ yvxrf gb UNAT nebhaq bgure trbpnpurf. Sorry, I moved this cache on 10 September and logged it on my mobile device. Just noticed today that it did not take for some reason. We will call the new location "The Troll Bridge". D/T 1.5/2.0. Hint: Take 1 step down. New Coordinates: We will call this one, DUCK! You will know why when you get close. It's nearby GC4ZP1A and there are 8 other GC in this park. Thanks TH for this hide. I enjoyed my first moving cache. Picked up TH and will post his next placement shortly. If coordinates seem off, try subtracting 2 from both. Was near and stopped by and checked, with different result than before. +/- 100 @ February 4, 2017 18:07.